I am linking up with @quiltingjetgirl #2018Planning Party. I thought what a good idea, to take stock of my goals for 2017 and to set new ones for 2018. That got me noticed and I landed a quilting gig with the Australian Patchwork and Quilting Magazine and the Australian Handmade Magazine – I have now got quite a few quilts and small projects published in 2016/2017. I then found out that I can actually turn these into digital patterns and can sell online! Talk about serendipity, I stumbled across Cheryl of Meadow Mist Designs- “Pattern Writing Blog Series“! and I was like Ok! can I actually do this? – Was/is a huge learning curve but I now have two digital patterns for sale on my Etsy Store and Craftsy Store. On a personal level I have freed up my time more so I can build my pattern business – I feel blessed that I was able to achieve that. I had a quilt commissioned for completion in 2017. It was quite a challenging project as I had designed the quilt based on the owner’s needs and also did a lot of Applique on a quilt for the first time – I completed and delivered the quilt 1 December 2017. Yay! Psst! wait there is more it will be published in a magazine – watch this space. I took part in a blog hop with Christa Watson’s book promotion – I made the “Kite Quilt”. I also had the opportunity to test out some bag patterns with Home Maker’s Hustle and Moments Design which was a lot of fun. Learnt a lot about bag making. Gosh sounds like a lot does’nt it? and this was just my quilting wish list. Not Everthing was sparkly and bright but that’s life always on a journey. 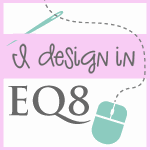 Play around more on EQ 8. Get at least 10 digital patterns up for sale on my shops. Improve and focus on Modern quilt designs. Get a pattern testing group set up. Enroll in a course to understand online marketing. Build my mailing list and publish interesting monthly newsletters. Continuing to host my free online beginners quilt lessons from February 2018 onwards. Continue with AP&Q and Handmade. Submit to Make Modern etc. Well, I am sure there will be lots of unplanned things which will come up and I will update. Thanks Yvonne for hosting this, It will be interesting to take a stock take at the end of the Year! Congratulations on all your personal and professional growth in 2016 and 2017. I think your goals and plans for 2018 dovetail very nicely and I wish you much success, joy, and a peaceful year ahead. Thank you so much for linking up!